Marchuk Y., Liem N.R., Halley L.D., Gaisinsky I. Summary. One of the most devastating consequences of vertebrobasilar artery occlusion is locked-in syndrome, and is most often associated with unfavorable clinical outcomes. Traumatic vertebrobasilar artery occlusion is increasingly recognized as a common cause of stroke in young patients. There is a growing body of evidence that early diagnosis and comprehensive differential treatment of this condition in early stage of ischemic neurologic event can lead to improved outcome. Identification and treatment of these injuries prior to the development of irreversible cerebral ischemia should be priority and demand a high degree of vigilance in patients with high-risk mechanism and injury patterns. Intracranial angioplasty stenting may be an efficient and life-saving procedure in patients with vertebra-basilar artery occlusion in addition to traditional pharmacological recanalization thrombolysis techniques. 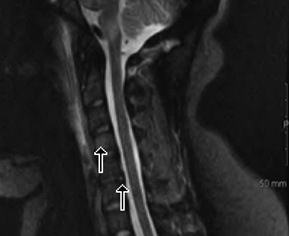 The objective of this case study is to describe and discuss the clinical management and outcome of a 34-year-old previously healthy female who developed a locked-in syndrome following a traumatic vertebral artery dissection. Case study. Patient underwent emergency stent assisted angioplasty of the vertebrobasilar arteries following antiplatelet/anticoagulation therapy to reperfuse the affected region. Computer tomography, magnetic-resonance imaging/magnetic-resonance angiography and angiography studies were used during initial evaluation and treatment. Rehabilitation program was initiated immediately following surgery. Results. Eighteen months after the accident she was able to ambulate independently without gait aids, using an ankle-foot orthotic only for long distance ambulation. She lives independently in an apartment, continues to be active, well motivated and plans to return to work in the near future. Сonclusions. Intracranial angioplasty stenting may be an efficient and life saving procedure in patients with vertebra-basilar artery occlusion in addition to traditional pharmacological recanalization thrombolysis techniques. This case illustrated a perfect combination of early diagnostic and surgical intervention followed by complex, multifaceted, intensive rehabilitation treatment, which led to significant recovery and excellent long term neurological outcome. Vertebrobasilar artery occlusion is associated with unfavorable clinical outcomes. 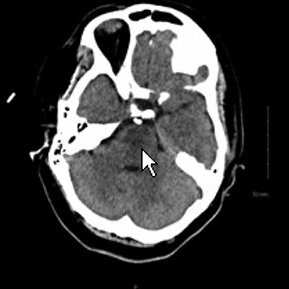 These lesions are responsible for approximately 4% of all ischemic strokes and the untreated mortality is estimated to be as high as 80 to 90% (Caplan L.R., 1996). The advent of high quality imaging, surgical and pharmacological recannalization techniques in the acute setting have resulted in decreased morbidity and mortality (Levy E.I. et al., 2001). However, persistent neurological deficits and long-term disability following successful rescue therapy are still common with up to 26% of patients experiencing severe neurological deficit at the time of discharge (Nadeau S. et al., 1992). One of the most devastating consequences of vertebrobasilar artery occlusion is locked-in syndrome. The classic locked-in syndrome, which is characterized by quadriplegia and anarthria with preserved consciousness and vertical eye movements, is of particular distress to both patients and physicians as the prognosis may be unclear and interventions may yield little benefit (Leon-­Carrion J. et al., 2002; Smith E., De­largy M., 2005). This case describes a young female with locked-in syndrome following traumatic vertebrobasilar artery occlusion. A favorable outcome was achieved by surgical, pharmacological and complex, multi-disciplinary rehabilitation treatment. A 34-year-old previously healthy female, who worked as a chiropractic assistant was climbing a 30-foot pole as part of a rock clim­bing simulation training (in the USA). She suddenly slipped and dropped 8 feet; her harness prevented her from hitting the ground but the sudden deceleration jerked her neck in the process. She immediately developed neck pain and headache but was able to walk away. Approximately 30 min later she experienced gradually worsening neck pain, dizziness, slurred speech and left sided weakness. She was stabilized by emergency medical personnel and transferred via flight ambulance to the local hospital. Her mental status and neurological condition declined and she was intubated and transferred to a tertiary care site for further evaluation and treatment. Upon arrival it was found that she had developed locked-in syndrome and was able to communicate only by blinking her eyes. Cerebral angiogram revealed a left vertebral artery dissection and occlusion, as well as occlusion of the basilar artery. TPA (tissue plasminogen activator)-therapy was not initiated as it had gone >3 h from the event onset. Emergent consultation with a neurovascular surgeon did take place and the patient underwent stent-assisted angioplasty of the vertebrobasilar arteries to reperfuse the affected region, followed by antiplatelet/anticoagulation therapy with clopidogrel, acetylsalicylic acid and intravenous heparin (Fig. 1). During the post-surgical period, the patient did undergo serial neuro-imaging studies. Two days following stenting there was no improvement in her neurological status. Computer tomography (CT) of the brain showed the development of a subtle low-density lesion in the Pons (Fig. 2). Magnetic-resonance imaging (MRI) performed later that day revealed the signs of showed an acute pontine infarct (Fig. 3). MRI of the cervical spine revealed a probable tear of the right posterior annulus at CV–CVI as well as a micro fracture at CIV (Fig. 4). Throughout the patient’s hospitalization, she was closely followed by the rehabilitation team including physiotherapy, occupational and speech language therapy. Once medically stable, she underwent tracheotomy and PEG tube placement, then she was transferred to Canada for further investigation and treatment. Approximately two weeks following the injury, she presented with incomplete quadriplegia. At this time a repeat MRI showed a late sub-acute pontine infarct that appeared to be approximately 10–14 days old (Fig. 5). During her nine-week stay in the Canadian acute care hospital, rehabilitation treatment continued including passive range of motion, stretching, augmentative communication and visual exercises. After her tracheo­stomy tube was removed, she was able to communicate using a communication board and blinking to identify letters to spell words. Vocally her speech was very soft and barely audible. She was started on a soft diet. She was next transferred to a stroke rehabilitation unit at that time was able to move her right arm with gravity elimination and communicate audibly in whispers. There was no voluntary movement of the left lower extre­mity outside of an extensor synergy with spasticity. She was non-ambulatory, and required assistance for transfers with a slide board due to poor sitting balance and trunk control. She also needed assistance with grooming, dres­sing, bathing and bed mobility. She stayed in the rehabilitation unit for nine weeks and underwent extensive task oriented, complex rehabilitation treatment including physio, occupational, speech language therapy, electromyo-stimulation, pain management, and psychological evaluation and therapy. While in the stroke rehabilitation unit, she made significant improvements to the point where she was able to transfer independently, ambulate independently with a single point cane indoors and a four-wheeled walker outdoors. She independently climbed the stairs with one rail. Mild motor deficits remained to the left upper and lower extremity and she required an ankle-foot orthosis (AFO) to control left foot drop. Approximately 7 months following the patient’s acute vertebrobasilar dissection and occlusion, catheter cerebral angiography revealed patency of the left vertebral and basilar arteries (Fig. 6). Fifteen months after discharge from physical rehabilitation, she ambulates independently without gait aids. Cognition and memory are intact. Speech is slightly dysarthric. Manual muscle test is 5/5 throughout all myotomes except left foot dorsiflexion and plantar flexion at 4/5. She has subtle difficulty with fine motor movement in the left upper extremity and mild dysmetria. She uses the AFO only for long distance ambulation. She lives independently in an apartment, conti­nues to be active, well motivated and plans to return to work in the near future. This case highlights a number of points in diagnosis and treatment of patient with posttraumatic vertebral artery dissection and consequent acute basilar artery occlusion. Dissection of the vertebral arteries has been increasingly recognized as a cause of ische­mic attacks and stroke (Lee V. et al., 2006). Overall, these conditions are estimated to account for only 3–4% of all ischemic strokes but they are an important factor in young people and account for approximately 20% of strokes in patients <45 years of age (Schievink W., 2001). Many dissections of the extra cranial vertebral artery are spontaneous though some are preceded by head and neck trauma (Caplan L.R. et al., 1985; Mas J.L. et al., 1987; Povlsen U.J. et al.,1987). Traumatic cervical vascular injuries occur most commonly after motor vehicle accidents or other impact mechanisms that cause rapid acceleration — deceleration mechanisms associated with cranio-cervical trauma (Kraus R. et al., 1999; Inamasu J., Guiot B., 2006). Also vertebrobasilar ischemia associated with abrupt head turning or chiropractic manipulation and arteriographic vertebral artery abnormalities at the C1 to CII vertebral level have been reported (Caplan L.R. et al., 1985; Mas J.L. et al., 1987; Povlsen U.J. et al.,1987). Sherman et al. reviewed over 50 cases of vertebral basilar infarction associated with an abrupt change in head position (Teasell R.W., Marchuk Y., 1999). Recent developments in non-invasive neurovascular imaging (magnetic-resonance angiography (MRA), CT, angiography etc.) have led to growing awareness of the problem and have revealed significant number of cervical vessel dissections in patients with blunt trauma (Redekop G.J., 2008). In patients with blunt trauma causing vascular injuries in the neck, manifestation of neurological symptoms may be delayed for hours and days. Although emerging high quality reliable, non-invasive technology has made diagnosis possible even in early stages, the highly variable course of vertebral artery dissection and possible devas­tating consequences of ischemia remains a major challenge for physicians. Most patients with dissection of vertebral artery show signs of unilateral low brainstem ischemia only and have a relatively benign course and good recovery (Rae-Grant A.D. et al., 1989; Schievink W., 2001). However in patients with extension occlusion to the basilar artery, recovery is usually poor and mortality is high (Mokri B. et al., 1988; Leon-Carrion J. et al., 2002). Vertebral artery dissection occurs when a tear in the endothelial surface of the artery allows blood to track into the wall of the artery leading to obstruction, ischemia, occlusion, and in some cases subarachnoid hemorrhage. Many cases that were originally described as due to thrombosis or obstruction may in fact have occurred secondary to a vertebral artery dissection (Teasell R.W., Marchuk Y., 1999). The basilar artery is the most important artery in the posterior circulation. It is formed at the pontomedullary junction by the confluence of both vertebral arteries. Given the anatomy of the posterior circulation and the circle of Willis, the clinical manifestations depend on the location of the occlusion, the extent of thrombus and collateral flow. The actual frequency, incidence, and prevalence of basilar artery occlusion are not known. Basilar artery occlusion was reported in 2 cases per 1000 autopsy cases. However, in stroke registries, basilar artery thrombosis may explain as many as 27% of ischemic strokes occurring in the posterior circulation (Nadeau S. et al., 1992). The prognosis of basilar artery occlusion is generally poor, although it depends on several factors that include decreased level of consciousness, dysarthria, pupillary abnormalities, bulbar symptoms, diplopia, bilateral cerebellar lesions, tetraplegia, and a cardiac cause of embolism. Up to 90% of patients with no such factors have a good functional outcome, while all patients with such factors either died or had severe disability (Caplan L.R., 1996; Leon-Carrion J. et al., 2002). Dissection of cervical and intracranial arteries of the posterior circulation is characterized by the sudden onset of pain, frequently severe, localized in the cranio-cervical region, followed by an abrupt, delayed, or progressive onset of ischemic symptoms. Selection of appropriate therapy for vertebral artery dissection is dependent upon the presenting symptoms, imaging and associated clinical factors. Arterial dissection can cause ischemic stroke either by thromboemboli forming at the site of injury or as a result of hemodynamic insufficiency due to severe stenosis or occlusion. In patients with symptoms and imaging consistent with this mecha­nism, and in whom there is no contraindication to antithrombotic therapy, anticoagulation or antiplatelet medication administering are the current standard of care for spontaneous or traumatic dissections (Teasell R.W., Mar­chuk Y., 1999). In patients with severe occlusion unres­ponsive or with contraindications to traditional antiplatelet/anticoagulation therapy, intracranial angioplasty stenting may be an efficient intervention option (Ralea I.C. et al., 2008). Recent advances in stent technology have allowed for a novel treatment of symptomatic, medically refractory, vertebrobasilar artery stenosis. Among 11 patients who were treated with stent assisted angioplasty of basilar or vertebral arteries 7 patients (64%) experienced symptoms resolution and have resumed their preprocedural activities of daily living (Levy E.I. et al., 2001). In another study, authors concluded that intracranial stent placement appeared to be an efficacious additional or alternative procedure for the treatment of intracranial artery thrombosis in patients with neurological symptoms lasting >6 h (Amista P. et al., 2007). Traumatic vertebrobasilar artery occlusion has been increasingly recognized as a common cause of stroke in young patients (Lam C.S., 1999). There is a growing body of evidence that early diagnosis and comprehensive differential treatment of this condition in early stage of ischemic neurologic event can lead to improved outcome. Identification and treatment of these injuries prior to the development of irreversible cerebral ischemia should be priority and demand a high degree of vigilance in patients with high-risk mechanism and injury patterns (Lam C.S., 1999; Redekop G.J., 2008). 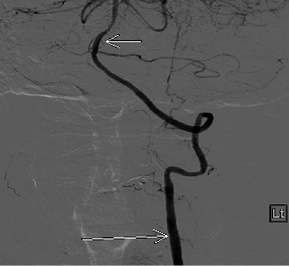 Intracranial angioplasty stenting may be an efficient and life saving procedure in patients with vertebro basilar occlusion in addition to traditional pharmacological recanalization thrombolysis techniques. This case illustrated a perfect combination of early diagnostic and surgical intervention followed by complex, multifaceted intensive rehabilitation treatment that led to an excellent recovery and long term neurological outcome! Amistà P., Munari M., Sartori M.T. et al. (2007) Intracranial stenting in four patients with acute ischemic stroke. J. Thromb. Haemost., 2(5 Suppl. ): P-M-691. Caplan L.R. (1996) Posterior circulation disease: clinical findings, diagnosis, and management. Blackwell Science Ltd., Cambridge, England. Caplan L.R., Zarins C.K., Hemmati M. (1985) Spontaneous dissection of the extra cranial vertebral arteries. Stroke, 16(6): 1030–1038. Friedman A.H. (1985) Arterial dissections. In: Wilkins R.H., Rengachary S.S. (Eds) Neurosurgery. McGraw-Hill, New York, p. 1297–1300. Inamasu J., Guiot B. 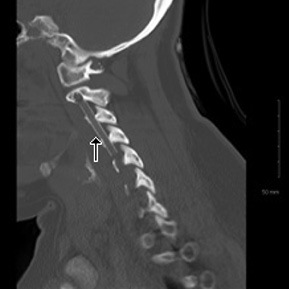 (2006) Vertebral artery injury after blunt cervical trauma: an update. Surg. Neurol., 65(3): 238–246; discussion 245–246. Kraus R., Bergstein J., Debord J. (1999) Diagnosis, treatment, and outcome of blunt carotid arterial injuries. Am. J. Surg., 178(3): 190–193. Lam C.S, Yee Y.K., Tsui Y.K., Szeto M.L. (1999) Vertebral artery dissection: a treatable cause of ischemic stroke. Hong Kong Med. J., 5(4): 398–401. Lee V., Brown R., Mandrekar J., Mokri B. (2006) Incidence and outcome of cervical artery dissection: a population-based study. Neurology, 67(10): 1809–1812. Leon-Carrion J., van Eeckhout P., Dominquez-Morales Mdel R. (2002) The locked-in syndrome: a syndrome looking for a therapy., 16(7): 555–569. Levy E.I., Horowitz M.B., Koebbe C.J. et al. (2001) Transluminal stent-assisted angioplasty of the intracranial vertebrobasilar system for medically refractory, posterior circulation ischemia: early results. Neurosurgery, 48(6): 1215–1223. Mas J.L., Bousser M.G., Hasboun D., Laplane D. (1987) Extra cranial vertebral artery dissections: a review of 13 cases. Stroke;18(6): 1037–1047. Mokri B., Houser O.W., Sandok B.A., Piepgras D.G. (1988) Spontaneous dissections of the vertebral arteries. Neurology, 38(6): 880–885. Nadeau S., Jordan J., Mishra S. (1992) Clinical presentation as a guide to early prognosis in vertebrobasilar stroke. Stroke, 23(20): 165–170. Povlsen U.J., Kjaer L., Arlien-Søborg P. (1987) Locked-in syndrome following cervical manipulation. Acta Neurol. Scand., 76(6): 486–488. Rae-Grant A.D., Lin F., Yaeger B.A. et al. (1989) Post traumatic extra cranial vertebral artery dissection with locked-in syndrome: a case with MRI documentation and unusually favorable outcome. J. Neurol. Neurosurg. Psychiatry, 52(10): 1191–1193. Ralea I.C., Nighoghossian N., Tahon F. et al. (2008) Stenting of symptomatic basilar and vertebral artery stenosis in patients resistant to optimal medical prevention: the lyon stroke unit experience. Eur. Neurol., 60(3): 127–131. Redekop G.J. (2008) Extra cranial carotid and vertebral artery dissection: A review. Can. J. Neurol. Sci., 35(2): 146–152. Schievink W. (2001) Spontaneous dissection of the carotid and vertebral arteries. N. Engl. J. Med., 344(12): 898–906. Smith E/, Delargy M. (2005) Locked-in Syndrome. BMJ, 330(7488): 406–409. Teasell R.W., Marchuk Y. (1999) Vertebrobasilar artery stroke as a complication of cervical manipulation. Critical Reviews in Physical and Rehabilitation Medicine, 6(1): 121–129. Резюме. Одним из наиболее тяжелых последствий тромбоза вертебробазилярных артерий является синдром бодрствующей комы, чаще всего ассоциирующийся с неблагоприятными клиническими исходами. Травматический тромбоз вертебробазилярной артерии все чаще рассматривают в качестве самой распространенной причины развития мозгового инсульта у пациентов молодого возраста. Растущая доказательная база данных свидетельствует, что ранняя диагностика и комплексное дифференцированное лечение данной патологии в ранней стадии ишемических неврологических событий может способствовать улучшению клинических исходов. Выявление и лечение указанных повреждений до начала развития необратимой церебральной ишемии должно стать приоритетом в клинической практике, требующей повышенной настороженности у пациентов с высоким риском их развития. Интракраниальная ангиопластика методом стентирования может быть эффективным и жизнеспасающим вмешательством у пациентов с тромбозом вертебробазилярной артерии в дополнение к стандартной методике фармакологической реканализации с применением тромболитиков. Цель исследования данного клинического случая — описание и обсуждение терапевтической стратегии при лечении ранее здоровой 34-летней женщины с развившимся синд­ромом бодрствующей комы (апаллическим синдромом, или синдромом окружения) вследствие травматического расслоения вертебральной артерии. Клинический случай. Ангиопластика со стентированием вертебробазилярных артерий была произведена в ургентном порядке. Использовали такие методы исследования, как компьютерная томография, магнитно-резонансная томография/магнитно-резонансная ангио­графия и ангиография, до начала терапии и на протяжении всего курса лечения. Реабилитационное комплексное лечение в сочетании с фармакотерапией начато практически через несколько часов после проведенного оперативного вмешательства. Результаты и их обсуждение. Через 18 мес после травмы больная могла передвигаться без посторонней помощи, используя лишь стабилизирующее ортопедическое устройство «ankle-foot orthotic», фиксирующее голеностопный сустав и стопу, при ходьбе на большие расстояния. Пациентка самостоятельно проживает в личных апартаментах, ведет активный образ жизни, высоко мотивирована к возвращению к трудовой деятельности в ближайшем будущем. Выводы. Рассмотренный случай демонстрирует, что ранняя диагностика и хирургическое лечение в сочетании с медикаментозным и комплексным реабилитационным лечением могут способствовать значительному улучшению и восстановлению функций и независимости у больных с синдромом окружения (апаллическим синдромом, или синдромом бодрствующей комы) в результате травматического расслоения и тромбоза вертебробазилярных артерий. Ключевые слова: синдром бодрствующей комы, посттравматический тромбоз вертебробазилярной артерии, реабилитация. Резюме. Одним із найтяжчих наслідків тромбозу вертебробазилярних артерій є синдром чуйної коми, що найчастіше асоціюється з несприятливими клінічними результатами. Травматична тромбоз вертебробазилярної артерії все частіше розглядають як найбільш поширений фактор розвитку мозкового інсульту у пацієнтів молодого віку. Зростаюча доказова база даних свідчить, що рання діагностика та комплексне диференційоване лікування зазначеної патології в ранній стадії ішемічних неврологічних подій може сприяти покращенню клінічних результатів. Виявлення та лікування цих уражень до початку розвитку безповоротної церебральної ішемії має стати пріоритетом у клінічній практиці, що потребує підвищеної настороженості щодо пацієнтів із високим ризиком їх розвитку. 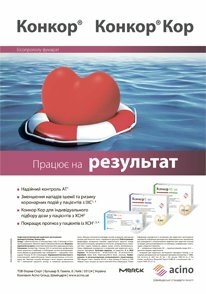 Інтракраніальна ангіопластика за методом стентування може бути ефективним та життєрятівним втручанням у пацієнтів із тромбозом вертебробазилярної артерії у додаток до стандартної методики фармакологічної реканалізації із застосуванням тромболітиків. Мета дослідження наведеного клінічного випадку — опис та обговорення терапевтичної стратегії при лікуванні попередньо здорової 34-річної жінки, в якої розвинувся синдром чуйної коми (апалічним синдромом, або синдромом оточення) внаслідок травматичного розшарування вертебральної артерії. Клінічний випадок. Ангіопластика зі стентуванням вертебробазилярних артерій була здійснена в ургентному порядку. Застосовували такі методи дослідження, як комп’ютерна томографія, магнітно-резонансна томографія/магнітно-резонансна ангіографія та ангіографія, до початку терапії та впродовж всього курсу лікування. Реабілітаційне комплексне лікування у поєднанні з фармакотерапією розпочато практично через кілька годин після проведеного оперативного втручання. Результати та їх обговорення. Через 18 міс після травми хвора мала змогу пересуватися без сторонньої допомоги, використовуючи лише стабілізуючий ортопедичний пристрій «ankle-foot orthotic», що фіксує гомілку та стопу, при ходьбі на велику відстань. Пацієнтка самостійно мешкає у власних апартаментах, веде активний спосіб життя, високо вмотивована щодо повернення до трудової діяльності в найближчому майбутньому. Висновки. Наведений випадок демонструє, що рання діагностика та хірургічне лікування в поєднанні з медикаментозним та комплексним реабілітаційним лікуванням можуть сприяти суттєвому покращенню та відновленню функцій та незалежності у хворих із синдромом оточення (апалічним синдромом або синдромом чуйної коми) внаслідок травматичного розшарування і тромбозу вертеб­робазилярних артерій. Ключові слова: синдром чуйної коми, посттравматичний тромбоз вертебробазилярної артерії, реабілітація.